Illinois is also one of the most expensive states to file a dog bite claim in. Only New York ($56,628) and Michigan ($38,302) recorded higher average claims per incident, making Illinois the third costliest state to treat injuries resulting from dog bites. The cost of all claims is skyrocketing nationwide, with an uptick of about 15% in the last year alone and this is being attributed to the rising cost of healthcare and attacks that are more severe. Homeowners are responsible for their pets but everyone can take actions that will limit their risk of being attacked or injured. The actions that homeowners may take to reduce the chances that their animals will attack other human beings include the following. Choosing a less aggressive breed. While it is true that any dog can be made violent, some have stronger instincts toward violence than others. Never underestimate the ability of any animal to do harm, however, as golden retrievers are involved in many dog bite cases as well. Socializing your animal. Dogs tend to be much more docile when they have had plenty of exposure to human beings. When they’ve been kept in isolation, they take a more defensive stance toward people and view them as a threat. Refrain from violent training methods. Hitting an animal teaches it to view your hand or the item used as a threat. Should the dog get loose, it could attack simply because it feels threatened by the hand movements of the person it comes in contact with. Make sure the animal is contained. This means walking the dog on a leash, providing a fenced yard that the dog cannot escape from and supervising the animal when in the presence of guests. 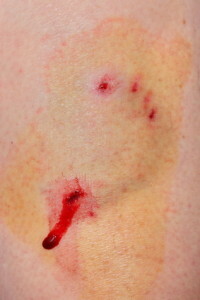 As stated earlier, homeowners are responsible for their animals but being attacked by a dog is never a pleasant affair. Consider the following ways that you can protect yourself so that you are not the victim of a dog attack. Never approach a dog that you are unfamiliar with. The animal might not be as kind and gentle as the family dog you remember well and its owner may have taught it to be violent. Don’t make any sudden or threatening movements when encountering a roaming animal. These can make the dog view you as a threat. Most dog bites are defensive, meaning the dog is just trying to make the victim respect its territory. If you are indoors, remain inside and report the presence of a roaming dog rather than running out to meet it. You’ll never know if the dog is diseased, aggressive or completely harmless. It is best not to take the chance. Keep in mind that your dog does not need to actually bite another person in order for you to be held liable for its actions. Many of the claims made due to dog attacks include incidents where the animals knock over the elderly, are too rough with children or push bicyclists off of their bikes when they are passing by. Even the friendliest of animals can unintentionally hurt other people so make sure that your animals are always under supervision and cannot roam your neighborhood freely. To learn more about what steps to take following a dog attack or whether you should file a claim, contact the Rosenfeld Injury Lawyers LLC.